If you’re in the Phoenix area, this event is worth checking out: Mesa is hosting A Day at the Diamond on Saturday, Feb. 21, from 11 a.m. to 5 p.m. to mark the return of the Oakland A’s and the Hohokam Stadium reopening. We’ve posted the San Francisco Giants 2015 spring training schedule, which includes 33 Cactus League games, including 17 at Scottsdale Stadium. 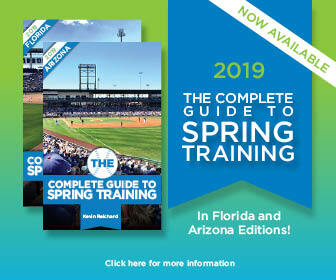 We’ve posted the Oakland Athletics 2015 spring training schedule, as the team preps for a move to a renovated HoHoKam Park.